This year for Halloween I got ahead of myself preparing for it, as I was eager to share something new in my Persian radio program at Radio Koocheh. The cookies you see in the picture are called Witch’s Finger cookies as I am sure most of you know. 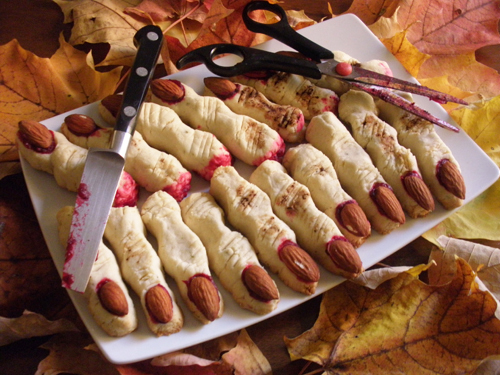 I thought calling them “Halloween ‘finger foods’ ” would do it more justice though! 1. Use edible red stuff instead of jell for blood effect. I used some cranberry sauce I had left over from my thanks giving dinner! 2. If your “dough” does not look like dough and is sort of scattered, don’t worry! It would still once you start taking small pieces and forming them in the shape of fingers.